interesting is how well they relate to each other. This first brief looks at a report that shows about one-quarter of all child abuse reports are substantiated, according to researchers at the University of New Hampshire’s Carsey Institute. Much of the report focuses on the difference between urban and rural child abuse reports and substantiation. I found two parts of the report more interesting. 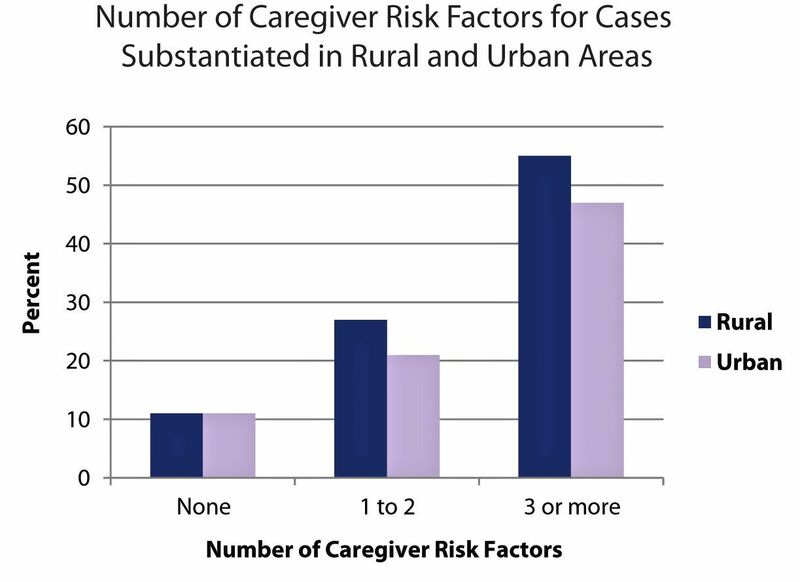 One — the big difference between caregivers who had several risk factors — alcohol and other drug addiction, family violence and mental illness — and those who had only one or two. 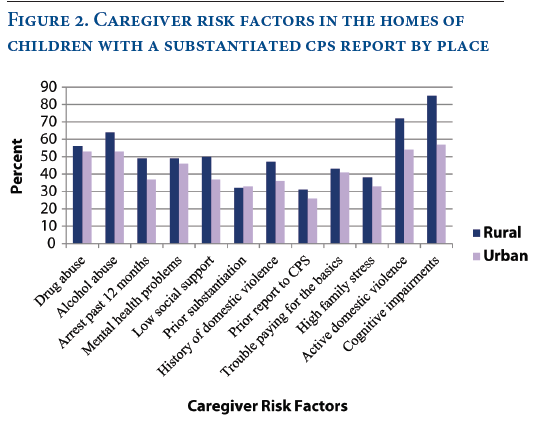 About one-half of the caregivers with three or more risk factors had a child abuse report substantiated, compared with only 22 percent of those with one or two risk factors. Substantiation is linked to a range of services and actions, yet it is just as critical to recognize that many families reported to CPS are struggling regardless of whether the report of child maltreatment has an outcome of substantiation….Many children with reports that are not substantiated have similar outcomes and long-term trajectories as children with substantiated reports, such as a subsequent CPS report and a subsequent foster care placement. That last sentence seems to point out one more reason why our system to prevent and stop child abuse needs a makeover. Another way of looking at the findings in this report is to say that 75% of child abuse reports are not substantiated. But, apparently, for many children, that might not make a difference. The research was conducted by Wendy Walsh, research associate professor of sociol­ogy at the UNH Crimes against Children Research Center and a research associate at the Carsey Institute, and Marybeth Mattingly, director of research on vulnerable families at the Carsey Institute and a research assistant professor of sociology at UNH. They used data from the second National Survey of Child and Adolescent Well-Being, a national survey sponsored by the U.S. Administration on Children and Families. According to the research report, “the survey includes 5,873 children, ages birth to 17.5 years old, who had contact with the child welfare system within a 15-month period beginning in February 2008.” Here’s a PDF of the Child-Abuse-Substantiation report. A student who can walk into the classroom one morning and go straight to their teacher and say, “Something terrible happened to me…” is going to get the help he or she needs and is going to come through it, with the understanding and support necessary for survival of the unthinkable. Not to be on a downer trend today, but the next roundup bit provides an example of how a girl didn’t get help for a long, long time. BRENDA DELLA CASA POSTED THE STORY ABOUT HER VERY GRIM history on Huffington Post this morning. She put this headline on it: “Healing the Scars of Child Abuse: ‘Until Now I’ve Been Afraid To Tell My Story. But Fear Should Be Faced Head-On”. It’s difficult to read. But hundreds of people on Facebook have recommended it already, so it’s clear that her story resonates with many others. Della Casa wrote Cinderella Was a Liar, a book about dating myths that’s heavy on the “how-to-please-him” approach. When school teachers and church members saw me falling asleep out of sheer exhaustion and unable to sit down due to searing burns brought on by beatings from leather belts, hangers, wires and flyswatters the previous night, law officials were often called in. Women would come into the school to watch me undress, gasp at the marks and listen to my story. I learned after a few “meetings” with my father that these well-intentioned men and women were excellent in coming in and repeating everything I had told them in confidence, but “protecting me” was a whole area of expertise they lacked. Keeping my mouth shut and lying about my wounds became my new specialty. Of course many people will wonder how something like this can happen with nobody intervening. Eventually, they did. But it took a long time. And I can’t tell you how many stories I’ve heard that are similar and even worse. This is Brenda Della Casa and I appreciate your mention of my piece. That said, my book is all about how to please and get to know yourself and warns women about abusive men, even sharing the National Domestic Violence campaign. Please reword your piece as it is not factual and makes a very dangerous and incorrect assumption about me.